My acquaintance with J.R. dates back to when I was a fourth-grade student in Bogenhausen, a suburb of Munich, in the early 1950s. Elementary schools in Germany at the time were still segregated according to gender. In our school, staffed by women teachers, the only male we saw up close was the chaplain who taught our catechism class. Herr Kaplan, as we called him using his title instead of his name, was short and stocky, with dark hair and fingers stained yellow from smoking. His quiet, low-key demeanor seemed to complement his simple black suit and stiff white collar. We thought he was all right. My acquaintance with J.R. dates back to when I was a fourth-grade student in Bogenhausen. One day, Herr Kaplan told us that a new priest would be joining the school staff to prepare us for our first Communion, an important milestone in our lives. We were anxious and excited. What would the new priest be like? Would he be nice to us? Would he like us? When the classroom door opened one morning, two black-clad gentlemen walked in: The first one we knew. The second one was young and slender, his suit too skimpy to fit his tall frame. He was our new teacher, introduced to us as Herr Ratzinger. 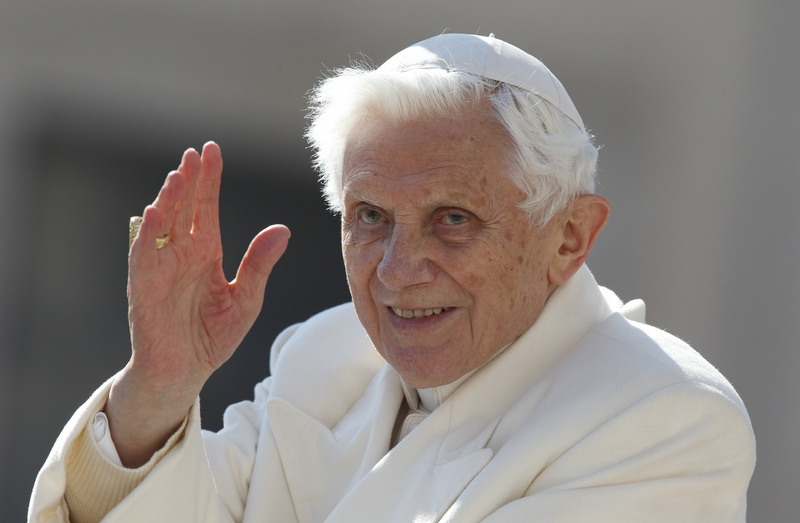 His full name was Joseph Ratzinger; we called him J.R. He had just completed his seminary training in Freising, a town about 20 miles north of Munich. From that day on, we fervently looked forward to our catechism class. We cheered our new teacher as he entered our gray, postwar school days. J.R.’s knowledge of the church seemed bottomless, his patience with us infinite. We duly intoned: “Ecce Agnus Dei, Ecce qui tollit peccata mundi.” We translated all the Latin phrases of the Mass, but did we really understand what we were memorizing? I am not sure any of us could have repeated J.R.’s explanations of canon law; but instead of scolding us when we fell short, he gently reworded the questions to meet our way of reasoning. But what mattered most to us was his bright face and enthusiasm. J.R.’s knowledge of the church seemed bottomless, his patience with us infinite. It was not to last. After only a short time, we learned that J.R. had suddenly and quietly left to pursue further studies at the university. We were inconsolable. We must write to him, we said in a chorus. We debated endlessly. I was given the task of secretary to take down notes from class members and to transpose everyone’s thoughts into words of disappointment and hope that he would return to us soon. I wrote the letter, accordingly, in the name of our class. Did we really expect to hear from J.R.? One day I received a reply: a carefully drafted letter, an entire page, in his fine handwriting that almost resembled Arabic with its small, even, round letters, fluidly connected. Forever the teacher, he wrote about the proper path to follow in growing up, illustrating it with an analogy: “If one buttons one’s coat the wrong way, one would have to undo all of it and start over again to make it right,” he wrote. “So it is with life.” He admonished us, therefore, to choose the right path from the beginning. He signed it simply, Joseph Ratzinger. I no longer have that letter that I see so clearly in front of me. I must have lost it during my many moves. I no longer have that letter that I see so clearly in front of me. I must have lost it during my many moves. I continued my life with and without the church, with and without family, with and without my homeland. And periodically, from a distance, I was able to follow his trajectory in the church. After more than 30 years, I decided to write to him, reminiscing about the early days in Bogenhausen. By then he was at the Vatican, serving as head of the Congregation for the Doctrine of the Faith. I did not expect to hear back from him, but he graciously responded in February 1987, sending me two small books he had written (The Feast of Faith and Liturgy and Sacred Music) with a full-page, type-written and signed letter. In my letter to him, I had mentioned the fact that upon arriving in the United States and attending Sunday church services, I missed the music that had always accompanied Mass when I was growing up. I missed the Bach organ music; I missed the choir and full orchestra performing Masses by Haydn and Mozart, music I had taken for granted as a child. I felt that I had lost my bond to the church. In his letter, he explained to me the deep connection between music and belief. He encouraged me to seek that bridge in whatever music I had access to, to find that path again from music to liturgy. I wrote to him once again at Christmastime in 2012. By then he had become Pope Benedict XVI. He graciously sent his good wishes in a beautiful card depicting the manger. He never left a note I sent unanswered. This time, I will be sure not to lose them. He was a speculative theologian and a writer. Also a very courteous old-world German with fine manners and old-fashioned habits. It's cool that you have these nice keepsakes. They're probably going to be valuable historical artifacts, given what happened at the end of his papacy. And of course, they have personal significance for you. Wishing Joe Ratzinger good health. God bless. This article also appeared in print, under the headline "Pope Benedict, my teacher, never failed to write me back ," in the June 11, 2018 issue. Elisabeth Haggblade has a doctorate in English philology from the Free University Berlin. She taught English and linguistics part-time at California State University, Fresno, at California State Polytechnic University in San Luis Obispo and at the Free University Berlin.